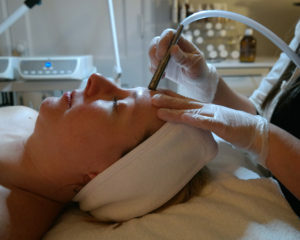 Microdermabrasion is a popular treatment for treating acne grades one and two. This special therapy unclogs dead skin in pores, helps speed up clearing acne and supports the prevention of future breakouts. It is a fantastic option for treating blackheads and whiteheads and is often combined with a chemical peel for clients who want to be more aggressive with their skin care plan. Microdermabrasion is not used for pustular or cystic acne as it can spread acne infection and cause it to become worse. It unclogs the pores and helps speed up clearing acne. It typically takes about a month for blackhead and whiteheads to heal themselves. It also helps keep acne at bay so it is a good treatment for acne prevention. Does microdermabrasion for acne hurt? No. It is very comfortable and relaxing. However, we also include manual extractions with microdermabrasion which can feel a bit tender. How long do the results of microdermabrasion for acne last? What should I expect after my microdermabrasion for acne treatment? There is no downtime with this treatment. Your skin will look great and feel good. This treatment is great before a night out. We can also add a LED light therapy which is complimentary and helps kill bacteria on the face. Are there any side effects with microdermabrasion for acne? There are no side effects with microdermabrasion for acne.